搶先看:2017-18 SP Authentic Hockey - 球員卡相關消息區 - 育盛球員卡(球星卡)及各類運動討論區 - Powered by Discuz! 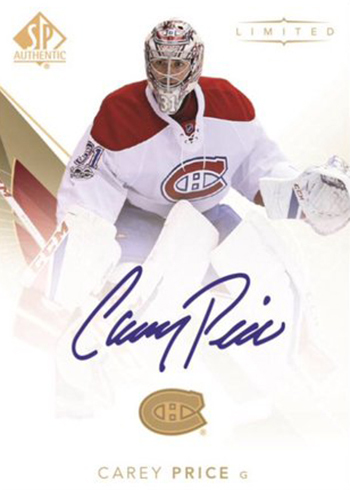 2017-18 SP Authentic Hockey continues with the tradition of an autograph-heavy checklist and broad appeal. 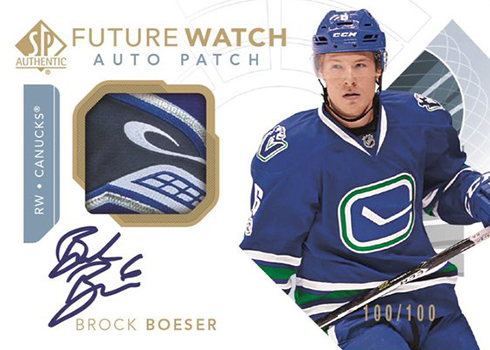 Future Watch Autographs are once again one of the keys with at least one of the signed Rookie Cards in every hobby box. 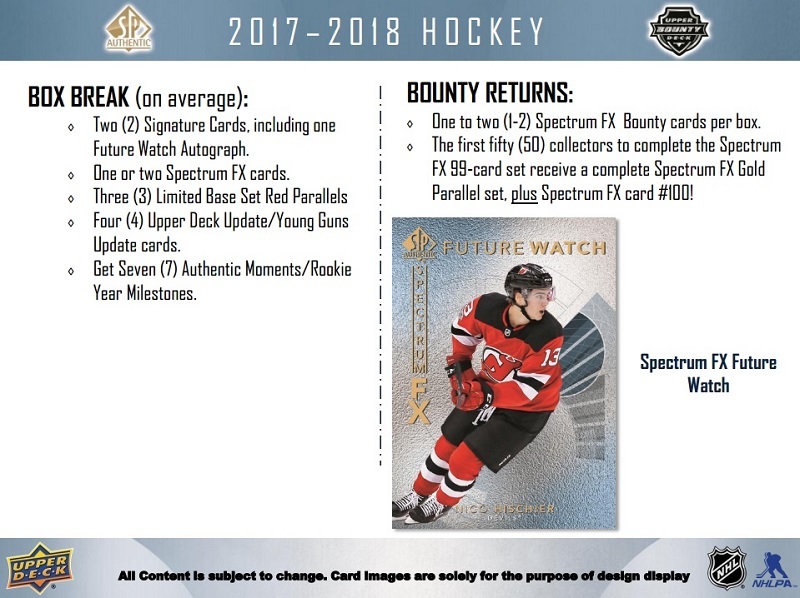 The Upper Deck Bounty program, which began in 2016-17 SP Authentic Hockey, gets another installment. Traditionally, SP Authentic is one of the most collected sets of the year. It’s not the rarest or most expensive product on the market, but it does have broad appeal and a longstanding history. The result means collectors chasing the product at several levels. 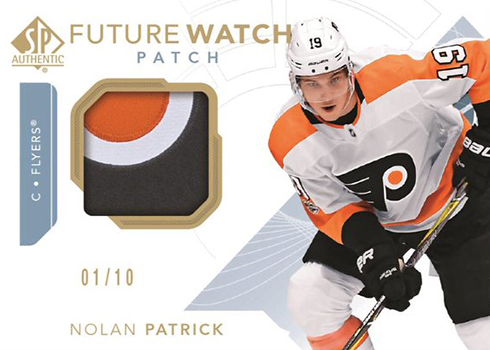 Future Watch Rookie Cards get lots of the attention. Once again, these come numbered to 999. That’s fairly high when you place them alongside other premium brands. Yet the popularity stands up due to all sorts of collectors going after them. Besides typical RC and autograph fans, set builders bring in significant interest as well. The 100-card shell set has Red parallels. Future Watch cards aren’t the only part of SP Authentic with a lot of history. Sign of the Times is one of the most recognizable autograph inserts in the entire hobby. These date back to the brand’s early days, not just in hockey but baseball, football and basketball as well. Sign of the Times cards have up to eight signers featured on a card. 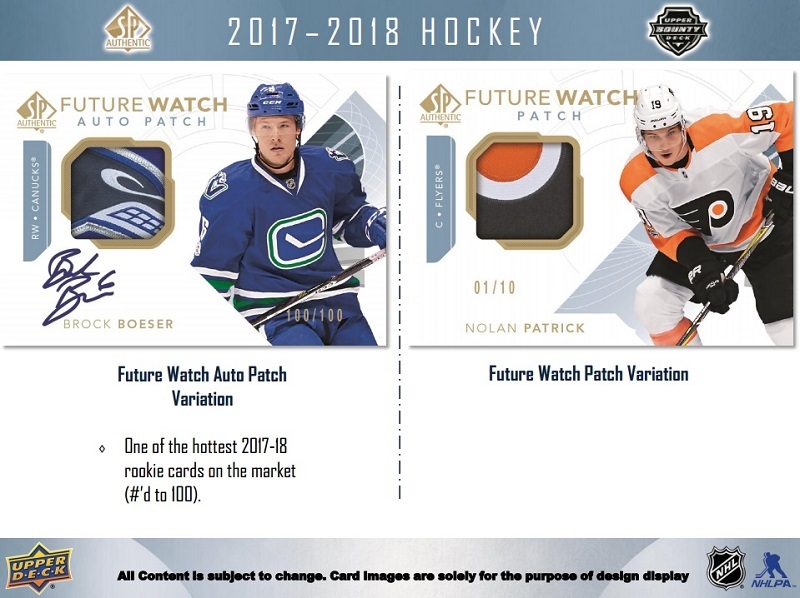 Future Watch Auto Patch variations add swatches. Numbered to 100, these also flip to a horizontal orientation. Some players who don’t have autographed Future Watch cards still have patch cards. These are numbered to 10. Select base cards have Limited autographed parallels (1:216 packs). These also come with gold spectrum foil. 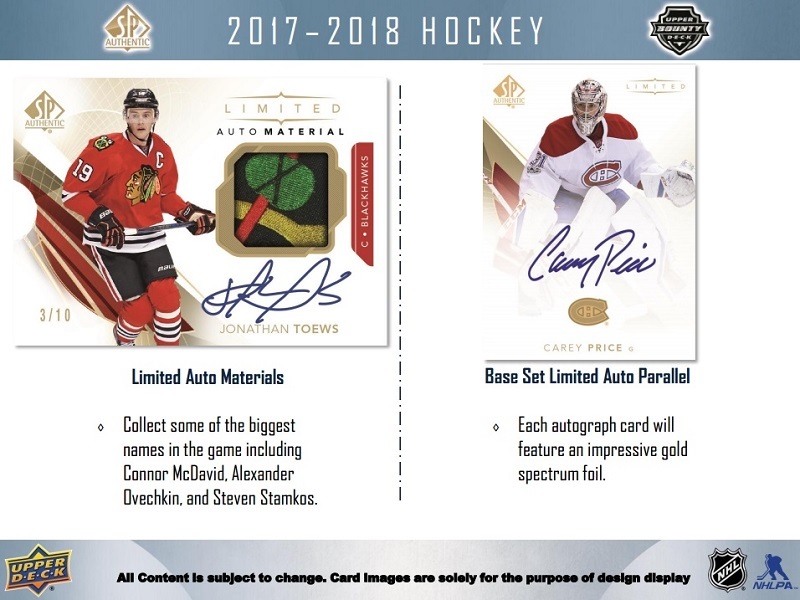 Other returning signature sets in 2017-18 SP Authentic Hockey include Great White North Signatures (1:576), Global Chirography (1:576), Marks of Distinction (/25) and Immortal Ink(/10). 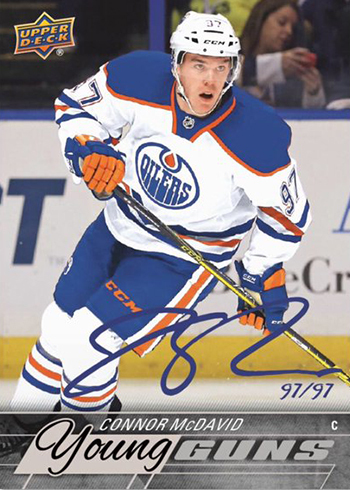 A total of 97 2015-16 Upper Deck Connor McDavid Young Guns autographed buybacks are randomly inserted in packs. These are newly signed versions of one of the superstar’s most popular Rookie Cards. 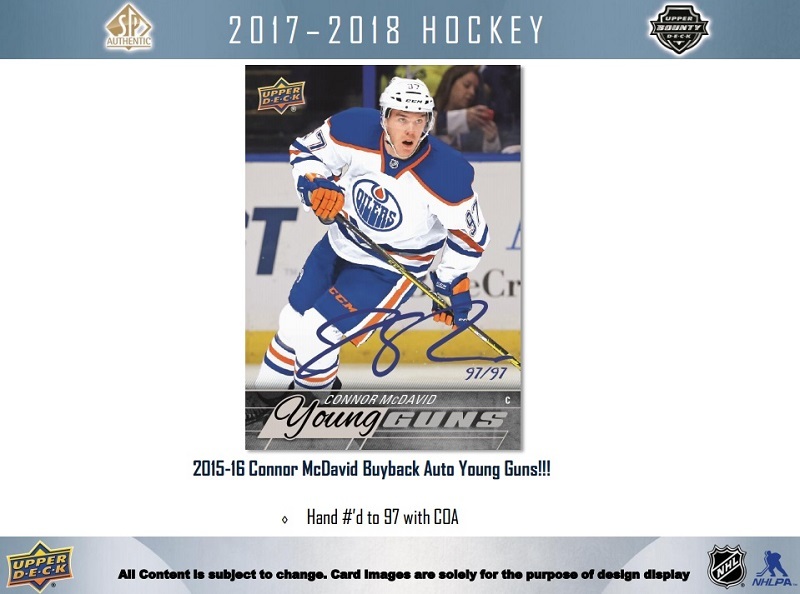 2017-18 SP Authentic Hockey has some other inserts and themes. Authentic Moments return for another year with big-time highlights. New Rookie Year Milestones cards picture veterans from their first seasons in the NHL. Both of these are inserted 1:6 packs with select cards coming with signed parallels. Other regular inserts include 1990-91 Retro Draft Picks (1:45 packs). These come with numbered autograph and Black Border Autograph (/10) versions as well. 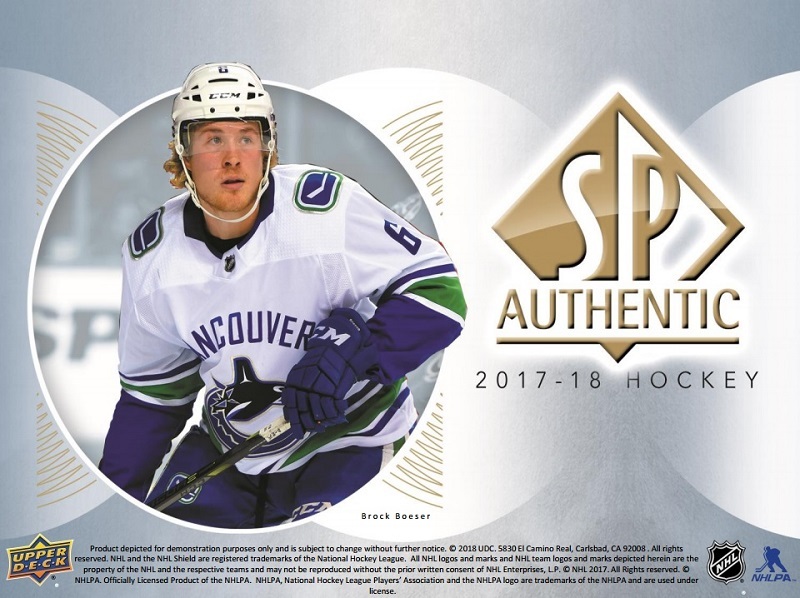 The 2017-18 Upper Deck Hockey checklist gets some additions in SP Authentic. These include both traded players in new uniforms and Young Guns that debuted later in the season. Like the main Upper Deck cards found in Series 1 and Series 2 packs, there are Exclusives (/100) and High Gloss (/10) parallels as well. Each 2017-18 SP Authentic box has four of the Upper Deck Updates. The Upper Deck Bounty program was created to encourage set building. Like last year, the 2017-18 SP Authentic installment revolves around Spectrum FX inserts, which land either one or two per box. Spectrum FX comes with a tiered checklist. Veterans are the most common at 1:18 packs. 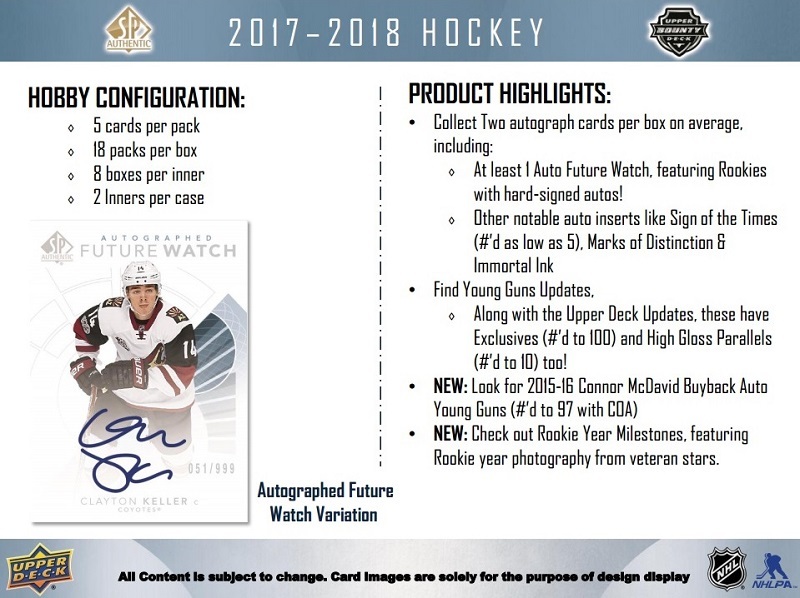 Future Watch cards come in three levels ranging from 1:36 packs to 1:360. The first 50 people to put the 99-card set together and have it verified by Upper Deck get an exclusive Spectrum F/X Gold parallel set. A special card #100 is also available.